The Pictures Generation was a loose affiliation of artists, influenced by Conceptual and Pop art, who utilized appropriation and montage to reveal the constructed nature of images. Experimenting with a variety of media, including photography and film, their works exposed cultural tropes and stereotypes in popular imagery. By reworking well-known images, their art challenged notions of individuality and authorship, making the movement an important part of postmodernism. The artists created a more savvy and critical viewing culture, while also expanding notions of art to include social criticism for a new generation of viewers saturated by mass media. Influenced by the ubiquity of advertising and the highly saturated image culture of the United States, Pictures Generation artists produced work that itself often resembles advertising. In thus challenging traditional art forms that appear handcrafted, these artists situated themselves at the center of postmodern debates about authenticity and authorship while in the process creating art that is slick and has the appearance of mass production. Their works blur the lines between high art and popular imagery. Though many artists in the group were trained formally in traditional disciplines such as painting and sculpture, they elected to utilize their skills in unorthodox ways - re-examining composition, particularly within popular image production. The ready availability of cameras allowed artists to reconsider photography's stance as an artistic medium, composing images with conceptual frameworks. Like photography, video is the perfect medium through which to explore the blurry boundaries between originals and reproductions. The advent of the portable video camera along with the first examples of video art in the 1960s allowed Pictures Generation artists to analyze and critique television for the first time. The artists who would be involved in the Pictures Generation grew up in the 1960s when consumerism and mass media began to have a large impact on society. They were the first generation of artists raised with television. John Baldessari began his artistic education in San Diego and began introducing text and photographs into his paintings during the late 1950s. By the 1970s he had expanded his practice to include sculpture, film, installation, and printmaking. Like others of the Pictures Generation, Baldessari read newly available critical texts extensively, incorporating the theories of structuralist Claude Levi-Strauss into his artwork, particularly in the photomontage series Blasted Allegories. For Blasted Allegories, Baldessari arranged a series of photographs on a board to organize images as one would words in a sentence, playing with syntax and rhyme, destabilizing models of construction visually and linguistically. The stills depict various objects, stills from films and television, and bits of pop cultural ephemera. His work is humorous, juxtaposing visual jokes with seemingly straightforward text to obfuscate direct meaning. The words are relevant to the image shown, but when strung together with other sentences, they are not fully coherent. Through the prescribed images and text, the viewer acts as an active reader, scanning the visual and verbal sentence through the physical line, deriving his or her own sense of the work through various readings of the arrangement. The viewer is thus situated as an active producer of the work's meaning, questioning traditional notions of authorship and creativity. For Untitled Film Stills series, Cindy Sherman began photographing herself staged in various scenes that appeared to be from classical Hollywood films: a girl arriving in the big city, a girl cooking over the stove, a girl in lingerie dressing herself. The stills seem recognizable, but are taken from no particular movie, mimicking typical cinematic angles, lighting, and dramatization to convey a sense of the familiar. Critics have commented on Sherman's representation of females as "making strange" - forcing the viewer to be a more critical observer of the constructed re-representation, categorizing Sherman's work as a feminist intervention. Sherman draws attention to the fact that a woman's appearance is often associated with her identity: a woman is valued in society to be looked at. The film theorist Laura Mulvey established the term "male gaze" to illustrate the typical perspective of a filmgoer, who assumes the role of male subject. Taking the term from psychoanalysis, Mulvey surmised that vision works as a function of sexual and developmental drives, and male-directed films of the mid-20th century often served to place women in subjugated roles, relegating women to fetishized victims or villainous femmes fatales who were unable to be agents of their own destiny. Sherman's reworking of these archetypes, as creator and character, interrupts the male gaze and re-establishes the women in the photographs as agents, while simultaneously complicating the relationship as she freezes herself in these multiple roles. One of Longo's most well known series is Men in the Cities, a group of charcoal drawings that depicts various individuals frozen in exaggerated movements. The people are dressed in business garb, suits, jackets, ties, prim dresses, and heels, thrusting and careening wildly. The critic Craig Owens points out the "aestheticization of violence" within Longo's practice, as he freezes these ecstatic figures in moments of frenzy. There is a disparity, however, between the conservative attire and the jerky motions that renders these images somewhat mysterious and awkward. The men and women are still but convey kinetic movement in their positions, suggesting movement beyond the white background, beyond the frame. In the 1980s, as Ronald Reagan-era politics became synonymous with big business concerns and corporate branding, artists investigated how identities were being divorced from individuals, enforcing a type of alienation. Longo studied sculpture and he slyly insinuates three-dimensionality through suspension, hitting pause to question how citizens are complicit in the society in which they participate despite an adherence to so-called proper appearances. Levine produced a series of photographs in 1981 by re-photographing reproductions of Walker Evans' photographs from the Great Depression that were printed in catalogues. The gesture of re-photographing the famous images re-positioned the author, the viewer, and the subject. Levine more than merely reproduces the already reproduced photograph. By inserting herself as the author, she complicates the original intent of the image and exposes the power structures inherent in image production. The narratives of art history, which Evans has contributed to through his own photographic practice and subsequent fame, are often written by male authorities and feature mostly male artists. With After Walker Evans, Levine intervenes and re-writes the narrative, forcing the viewer to question how one creates meaning and history, and what is considered natural in the composition of a photograph. Additionally, Levine's appropriation of the image from a catalogue image speaks to how artwork is commodified and rendered authorless through reproductions and varied methods of circulation, echoing the theorist Walter Benjamin's concerns regarding "the work of art in the age of mechanical reproduction." Kruger began her career in advertising - specifically, working in graphic design and layout at Conde Nast - and the juxtaposition of image and text in her work often speaks to her former training. In Untitled (I Shop Therefore I Am) two fingers hold a palm-sized card outward. The card itself is wiped of its original face, as Kruger has clearly set "I shop therefore I am" across the flat red surface. The viewer can probably deduce that the original image displayed a credit card, tying the new text to its appropriation. The statement "I shop therefore I am" links the excitement of sponsored consumerism and constructed female identity. As popular formats like films, ladies' magazines, and department store advertisements dictate what is appropriately feminine and desirable, Kruger ironically turns the upbeat slogan against itself by displacing image from attractive arrangement. The interruption of bold text and bright crimson stop the viewer, forcing them to ask what representation and identity mean for women in a consumer society, and how advertising tries to shape this identity. 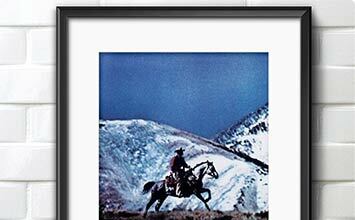 At first glance, one sees a seemingly romantic all-American image of a Stetson-topped cowboy against a brilliant blue expanse of mountain and sky in Richard Prince's Untitled (Cowboy). However, the photograph is grainy, somewhat unclear, an incomplete, imperfect image. Prince appropriated it from an advertisement for Marlboro cigarettes, instead re-photographing and distorting a page torn from a glossy magazine to track the construction of an American symbol: the Marlboro Man. In the beginning of his career, Prince worked in a New York publishing company collecting and sending physical pages from magazines to advertisers to prove that they were run in magazines. He began to photograph a series using the Marlboro Man advertisements, eliminating the text, cropping and blurring the existing image, and producing alternative meaning. Although the Western archetype of a cowboy has been long associated with an American masculine ideal, Prince disrupts the highly polished and constructed image by removing its context, reminding the viewer that mythic ideals inform consumer habits and that the viewer is complicit in the creation of that myth. Fred Wilson's work focuses on institutional bias and derives from the work of earlier Conceptual artists such as Hans Haacke and Marcel Broodthaers. His works criticize arts institutions and reveal larger issues surrounding the social function of art as a mass-media influence. In this work at the Maryland Historical Society, Wilson rearranges pieces of the collection to highlight overlooked aspects of Maryland's history. For example, in a display of teapots and other ornate silver pieces, Wilson inserts a pair of slave shackles that were made in the same time period. Their inclusion upsets the traditional distinction between arts and crafts while also highlights the white European vantage point of the museum's exhibition, which attempts to whitewash Maryland history. Birnbaum is one of the best-known Pictures Generation artists to work in video, specifically critiquing television. Her Technology/Transformation: Wonder Woman examines the paradoxes implicit in the 1970s "Wonder Woman" television program by cutting up scenes from the show and reposing a disco song about the superhero. In the video, bursts of fire, meant to suggest the deconstruction of ideologies in television, open the piece. Birnbaum repeats TV sequences when character Diana Prince transforms into Wonder Woman, making the superhero appear as a wobbly music-box figurine, without her supposed strength. The lyrics from the 1978 song "Wonder Woman in Discoland" also play across the screen, further undermining the character by underscoring the sexual source of Wonder Woman's "empowerment."